Persistent infection of Penaeus stylirostris densovirus (PstDNV) (also called IHHNV) and its non-infectious inserts in the black tiger shrimp, Penaeus monodon (P. monodon) genome are commonly found without apparent disease. Here, we introduced the method of multiplex PCR in order to differentiate shrimp with viral inserts from ones with the infectious virus. The method allowed us to study the effect of pre-infection of IHHNV, in comparison to IHHNV inserts, on WSSV resistance in P. monodon. A multiplex PCR system was developed to amplify the entire IHHNV genome, ensuring the accurate diagnosis. Field samples containing IHHNV DNA templates as low as 20 pg or equivalent 150 viral copies can be detected by this method. By challenging the two groups of diagnosed shrimp with WSSV, we found that shrimp with IHHNV infection and those with viral inserts responded to WSSV differently. Considering cumulative mortality, average time to death of shrimp in IHHNV-infected group (day 14) was significantly delayed relative to that (day 10) of IHHNV-inserted group. Real-time PCR analysis of WSSV copy number indicated the lower amount of WSSV in the IHHNV-infected group than the virus-inserted group. The ratio of IHHNV: WSSV copy number in all determined IHHNV-infected samples ranged from approximately 4 to 300-fold. The multiplex PCR assay developed herein proved optimal for convenient differentiation of shrimp specimens with real IHHNV infection and those with insert types. Diagnosed shrimp were also found to exhibit different WSSV tolerance. After exposed to WSSV, the naturally pre-infected IHHNV P. monodon were less susceptible to WSSV and, consequently, survived longer than the IHHNV-inserted shrimp. The global shrimp aquaculture, with export values of billion dollars per year in the past decade, is a key economic sector of several countries in Asia and South America . Despite overall shrimp production from aquaculture continuing to rise, shrimp susceptibility to viral pathogens is a constant threat to the shrimp production. Development of effective means that would reduce risks posed by viruses will be beneficial to the shrimp culture industry. A shrimp parvovirus (densovirus) was first identified from high mortality disease outbreaks in cultured Penaeus stylirostris in the Americas , and it has been classified as Penaeus stylirostris densovirus (PstDNV) in the family Parvoviridae. PstDNV is also known as infectious hypodermal and haematopoietic necrosis virus (IHHNV), and it will be referred to as IHHNV in the present work. Its genome contains a linear single-stranded DNA with an estimated size of 4.1 kb [4, 5]. To date, 3 types of IHHNV have been reported based on their original found location and DNA sequences [6, 7]. Target organs for IHHNV include gills, cuticular epithelium (or hypodermis), all connective tissues, haematopoietic tissues, lymphoid organ, antennal gland, ventral nerve cord - its branches and its ganglia . More recently, non-infectious inserts of IHHNV in the shrimp genome have been found in both captured and farmed P. monodon from East Africa, Australia, and Thailand [9, 10]. Recently, the study by Saksmerprome et al. (2011) indicated that random insertion of IHHNV sequences may yield false-positive results by using the currently recommended detection methods. Thus, it is necessary to improve the detection method for diagnosis of a real IHHNV infection. Besides the diagnostic implications, it is interesting to investigate if viral insertion in shrimp genome is involved in natural, transmissible immunity in crustaceans as previously proposed . In addition, previous reports demonstrated that P. vannamei and P. stylirostris with pre-infection of IHHNV were more resistant to white spot syndrome virus (WSSV) as compared to the IHHNV-free shrimp [12, 13], although the mechanism remains unknown. WSSV is one of the most severe viruses that could lead to mass mortalities in ponds and heavy production losses, therefore effective control strategies against the virus would be highly desirable. To elucidate the effect of persistent IHHNV infection and non-infectious viral inserts on WSSV resistance in P. monodon, a multiplex-PCR method developed herein was applied to conveniently distinguish between IHHNV-infected and IHHNV-inserted types. 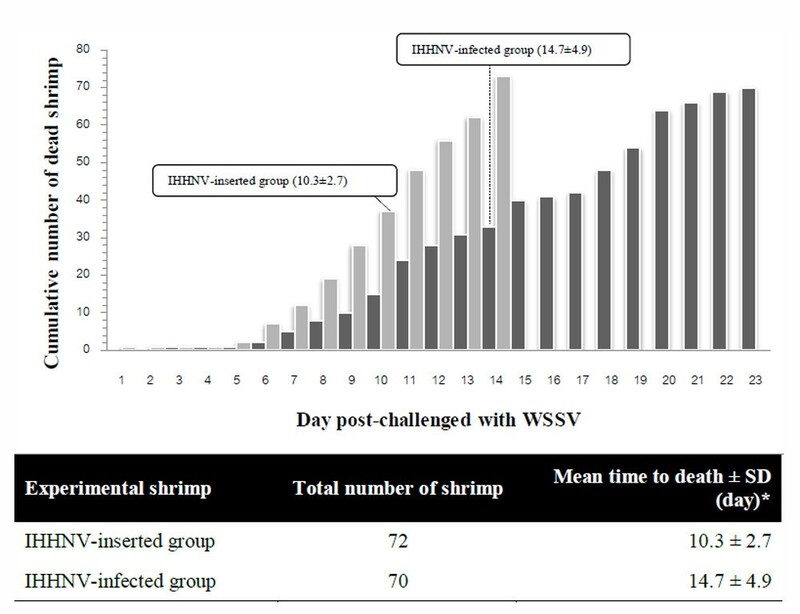 Then, the diagnosed shrimp with real IHHNV infection and viral inserts were examined for WSSV resistance by considering cumulative mortality, time-to-death, and WSSV copy number. Application of the multiplex PCR for selection of shrimp with viral tolerance could be useful for future development of a program of specific resistant (SPR) shrimp. http://www.dpi.nsw.gov.au/agriculture/livestock/animal-welfare/general/fish/shellfish with respect to details regarding the transport of the shrimp and their laboratory maintenance. With respect to processing the shrimp for histological analysis or for killing at the end of an experiment, the salt water/ice slurry method was used as recommended in the Australian guidelines. Experimental shrimp were fed twice daily with a commercial feed at 3% (w/w), for 1 week prior the experiment. To evaluate the effects of pre-infection of IHHNV on subsequent WSSV infection, shrimp were divided into two experimental groups, pre-infected IHHNV (n=106) and IHHNV-free ones (n=108). Shrimp were exposed to WSSV by co-culturing with a WSSV-infected shrimp. Pleopods of each shrimp was dissected at the moribund stage at each time interval and then stored in 70% ethanol before delivered to Centex shrimp, Bangkok, for analyses. Mortalities were recorded twice a day and the “time to death post-challenge” was determined for each bioassay. All collected samples were subjected to genomic DNA extraction using the phenol-chloroform procedure as described previously . DNA concentration in the extracts was quantified by spectrophotometry with A260/280 before adjustment to the concentration of 50 ng/μL in all assay. Real-time PCR was then performed in order to determine the copy number of both viruses in collected samples. The copy number of both IHHNV and WSSV were determined by using an external standard curve and plasmid DNA containing WSSV and IHHNV fragments as a standard (10-fold serial dilution, 107-101 copies). The copy number of analyses were calculated according to previous experiment . Real-time PCR was operated on StepOnePlus cycler (Applied Biosystems, Life technology) using 2X TaqMan® Universal PCR Master Mix. Twenty times probe and primers mix used in the experiment were shown in Table 1. All probes and primers were designed according to reference GenBank accession numbers of AF273215 (IHHNV), AF440570.1 (WSSV) and DQ021452 (Shrimp elongation factor). The deionized water was used to adjust the final mixture volume to 20 μL. Amplification profile comprised of one initial step of 50°C 5 min then 95°C 15 min then followed by 40 cycles of 95°C for 15 s and 60°C for 1 min as required by Applied Biosystems. All data generated from real-time PCR was analyzed by StepOnePlus software 2.0 according to standard operation. PCR efficiency (E) for WSSV and IHHNV detection in this study was calculated by the equation of [E = 10(−1/slope)]  using cycle threshold (Ct)  values fitted to a standard curve (WSSV; E=1.95, IHHNV; E=1.99). Statistical analysis of the viral copy number was carried out by one-way analysis of variance (ANOVA) with 95% confidence interval for mean using SPSS 16.0 software package. Here, we developed a multiplex PCR-based method that amplifies the complete IHHNV genome in one step via a two-tube method. In the case of samples with real infection, three and two bands were obtained from the first and second reactions, respectively (Additional file 1: Figure S1A-B). These results were expected, because the specimens were previously confirmed as being infected by IHHNV and should have the entire genome detected by primers in the multiplex method. Samples with non-infectious (inserts) gave incomplete results, while shrimp actin amplicon appeared in all lanes (Additional file 1: Figure S2A-B). Absence of any of the five DNA fragments was interpreted as a negative result with putative viral inserts. By agarose gel electrophoresis, the lowest amount of DNA template that gives visible PCR products for the two reaction was approximately 20 pg. The detection sensitivity of the multiplex PCR system was estimated to be 150 viral copy equivalents (Additional file 1: Figure S3A-B). It is possible that shrimp carrying non-infectious inserts are infected by the virus. If it is the case, the multiplex PCR may not be able to separate such specimens from those with IHHNV infection only. Nevertheless, the developed method remains useful for selection of specific pathogen-free shrimp. It also serves the main purpose of the study for investigating the effect of persistent IHHNV infection of WSSV resistance, regardless of the presence of non-infectious inserts within individuals. Experimental shrimp were divided into 2 groups based on the results of two-tube multiplex PCR detection method as described above. The first group was the IHHNV-infected group and the second was the IHHNV–inserted group (Table 2). Figure 1 shows a cumulative mortality of experimental shrimp after WSSV challenged. The average mean time to death ± standard deviation (SD) from these two groups are 10.3 ± 2.7 d; IHHNV-inserted group and 14.7 ± 4.9 d; IHHNV-infected group. Statistical analysis using SPSS 16.0 software (ANOVA) indicated that these two calculated values are significantly different (P<0.05). A graph of cumulative mortality of experimental shrimp after challenging with WSSV (top) and a table of calculated time to death data between IHHNV-inserted and IHHNV-infected group (bottom). Data was analyzed by ANOVA analysis using SPSS16.0 software. Asterisk (*) indicated the significant difference between mean of time to death from IHHNV-inserted and IHHNV-infected group with P<0.05. Grey and black columns indicated IHHNV-inserted and IHHNV-infected groups, respectively. (Uploaded separately). Multiplex MI should contained 3 PCR products (+ + +) and Multiplex MII should contained 2 PCR products (+ +). Mark (√) indicated the group for each sample after characterization by Multiplex PCR. A real-time PCR analysis using TaqMan® MGB Probe was performed to determine the number of viral copies of WSSV in shrimp from the two groups. Eight samples from the inserted group and eleven samples from the infected group were chosen, and then they were examined for DNA quality by amplification of shrimp housekeeping gene (shrimp elongation factor) using specific TaqMan® MGB Probe (Table 3). Determination of IHHNV and WSSV copy number was performed as described in materials and methods. The estimated mean ± SD of WSSV copies were 1.74 × 107 ± 1.78 × 107 copies for IHHNV-inserted group, and 2.74 × 106 ± 2.41 × 106 copies for IHHNV-infected group. Statistical analysis using ANOVA suggested that mean of WSSV copies from IHHNV-infected samples was significantly lower than those estimated from IHHNV-inserted samples (P<0.05). As mentioned above, some infected specimen may carry non-infectious inserts. If the viral inserts present in the shrimp were primed by the PCR primers used for quantification, the number of IHHNV copies per shrimp in the infected group could be overestimated. Unknown overestimations due to random inserts might explain a wide range of IHHNV copies per shrimp (from 8.02 × 105 to 4.28 × 108 copies), and the resulting IHHNV-to-WSSV ratios varied from 4- to 300-fold in IHHNV-infected samples (Table 4). Nonetheless, this does not alter the fact that WSSV copies in IHHNV-infected samples were much lower than those in the inserted ones. Whether the persistence of IHHNV infection outcompete WSSV entry/replication in the infected shrimp should be further investigated by additional techniques, such as in situ hybridization. Asterisk (*) indicated that mean from these two groups were significant difference with P<0.05, NA= not applicable. Our findings suggested that shrimp with pre-infection of IHHNV exhibited a longer survival time after exposure to WSSV as compared to survival time of shrimp with IHHNV inserts. This is the first report on pre-infection with IHHNV delaying mortality induced by WSSV in P. monodon shrimp. Real-time PCR results revealed that IHHNV existed at a higher copy number relative to WSSV copy number in samples with infectious IHHNV, ranging from 4 to 300-fold. Our results were similar to those reported from P. stylirostris and P. vannamei. Persistence of IHHNV may block the entry of another virus by mechanism of down-regulation of viral receptor(s) or by competition for receptor binding . Moreover, target cells of IHHNV are hypodermal and mesodermal cells, whereas those of WSSV are ectodermal and mesodermal cells [19, 20]. If persistence of IHHNV is mainly in mesodermal cells, and it could out-complete WSSV replication in the infected cells. Therefore, the effects of WSSV infection in diseased shrimp, in turn, could be reduced. Future work should include investigating infected cells, specifically mesodermal cells, for possible viral interference between IHHNV and WSSV. Persistent IHHNV infection and non-infectious viral inserts in P. monodon can be commonly found, and it is interesting to elucidate any implication of their existence in nature. IHHNV pre-infected P. vannamei and P. stylirostris were reported to survive longer than non-infected ones after WSSV challenge [12, 13], however the detailed mechanism is not well-understood. In this study, a multiplex PCR method was developed to distinguish P. monodon with persistent IHHNV infection from those with viral inserts. Field samples containing IHHNV DNA templates, as low as 20 pg or equivalent of 150 viral copies can be determined by this method. While the multiplex PCR system could be used independently, use of the multiplex PCR as an additional detection procedure would ensure a more accurate diagnosis of a real infectious IHHNV by ruling out the possibility of viral genomic inserts in shrimp specimens. Finally, the method allowed us to conveniently prepare samples for studying the effect of pre-infection of IHHNV, in comparison to IHHNV inserts, on WSSV resistance in P. monodon. Our preliminary work suggests that persistent IHHNV infection could delay WSSV-induced mortality in P. monodon. This work was funded by Mahidol University and Thai National Center of Biotechnology and Genetic Engineering (BIOTEC). One of the plasmids used as a positive control in multiplex PCR was kindly provided by Dr. Arun K. Dhar (Advanced BioNutrition Corporation, USA). We thank Ms. Tareerat Lertwimon, Department of Biotechnology, Faculty of Science, Mahidol University for statistical analysis, and Ms. Somjai Wongtripop for providing samples of P. monodon. This work has been done at Centex shrimp, Faculty of Science, Mahidol University and Shrimp Genetics Improvement Center, Surat Thani, Thailand. Experimental shrimp were prepared and challenged by the assistance of BW and PP’s group. The method for differentiate between IHHNV inserts and real IHHNV infected samples was discovered by VS with the kind help of SJ and YJ. Viral copy number, real-time PCR work including data analysis and manuscript preparation was done by SM and VS under the supervision of CB, TW and BW. All authors read and approved the final manuscript.